School nurses and public health officials have been told to tone down the way they tell parents that their children are overweight. The letters have been “revised” from last year after feedback from experts and parents. In letters sent about children classed as “very overweight”, parents are no longer told: “Doctors call this clinically obese.” Parents are told that their children could face health problems and low self-confidence in later life but the letter no longer says that they risk “heart disease and some types of cancer”. In the letter about overweight children, two sentences have been removed. 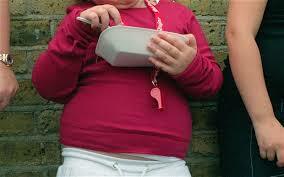 They said: “You might be surprised your child’s result is in the overweight range. It can sometimes be difficult to tell if your child is overweight as they may look similar to other children of their age, but more children are overweight than ever before.” The new letters also omit references to body mass index. Last year more than a million children were measured by the programme which found that in reception year, 22.6 per cent of children were overweight or obese, rising to 33.9 per cent in Year 6. The proportion of children who are clinically obese doubles from 9.5 per cent at the start of primary school to 19.2 per cent when they leave.